By using an advanced microscopy technique, researchers have collected the most precise measurements to date of DNA's tangled structure. Their results showed significant variations to the well-known double helix — variations that are offering fresh insights into the inner workings of this life-bearing molecule. This was a collaborative project by researchers from the National Physical Laboratory (NPL) and the London Centre for Nanotechnology (LCN). To measure and conceptualize large, irregularly arranged chunks of individual DNA molecules, they used a technique called "soft-touch" atomic force microscopy (AFM). But the technique doesn't allow scientists to actually see the DNA. Rather, a miniature probe feels the surface of the molecules one by one. Results reaffirmed the structure first suggested by Watson and Crick in 1953. 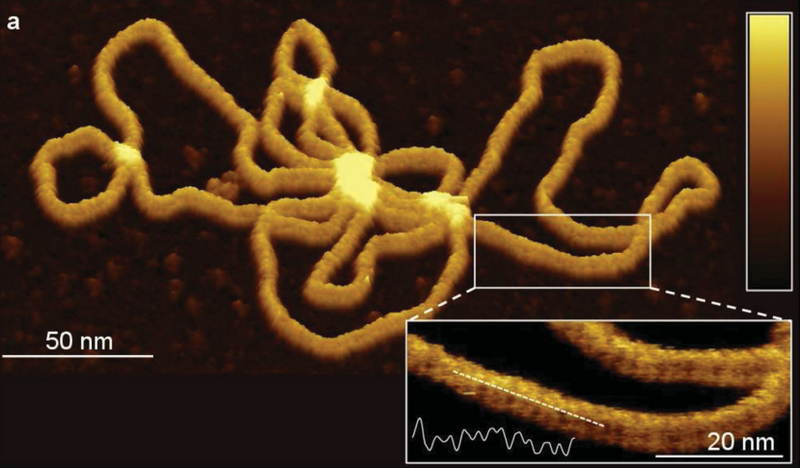 But surprisingly, the single-molecule images showed major variations in the depths and grooves in the double helix structure. This is significant because these grooves act as keyways for proteins, or molecular keys, that determine the extent to which a gene is expressed in a living cell. As noted by a NPL release, "Accurate measurements allow us to observe the variations in these key ways, which may then help us to determine the mechanisms by which living cells promote and suppress the use of genetic information stored in their DNA." Because the origin of these observed variations aren't yet fully understood, scientists can now take a look at these results in hopes of learning more. Read the entire study at Small: "Single-Molecule Reconstruction of Oligonucleotide Secondary Structure by Atomic Force Microscopy."